Turkey's prime minister has returned home from the World Economic Forum in Davos to a warm welcome after he stormed out of a debate over Israel's war on the Gaza Strip. 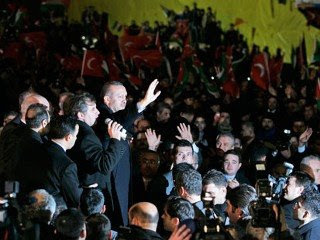 More than 5,000 people, many waving Palestinian and Turkish flags, greeted Recep Tayyip Erdogan after his aeroplane touched down early on Friday. Erdogan walked out of a televised debate on Thursday with Shimon Peres, the Israeli president, after the moderator refused to allow him to rebut Peres' justification about the war. Before storming out, Erdogan told Shimon Peres, the Israeli president: "You are killing people." At least 1,300 Palestinians were killed during Israel's 22-day aerial, naval and ground assault on Gaza. Thirteen Israeli citizens died over the same period. Speaking to Al Jazeera at the Swiss resort, Tony Blair, the Middle East envoy for the quartet of the European Union, Russia, the United Nations and the United States, said: "Given what's happened in Gaza it would be surprising if people didn't feel really strongly about it. "Prime minister Erdogan, I know, because I spoke to him earlier in the day, feels passionately and really sad about what has happened to the people of Gaza. "And it's inevitable that you get this kind of incident". Erdogan then said: "Thank you very much. Thank you very much. Thank you very much. I don't think I will come back to Davos after this." Peres told reporters after the incident that Israel is not in conflict with Turkey. A prominent member of the Saudi royal family is warning the Obama administration that failure to alter US attitudes towards the Arab-Israeli conflict radically would threaten the kingdom's "special relationship" with the US and could force Riyadh to abandon its own support for a peaceful resolution of the dispute. 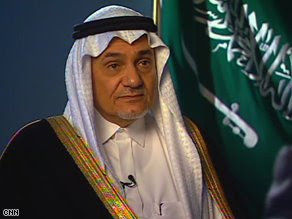 In an article in today's Financial Times, Prince Turki al-Faisal, former Saudi intelligence chief and former ambassador to Washington, says that if the US wants to continue playing a leadership role in the Middle East and maintain its strategic alliance with Saudi Arabia, the world's largest oil producer, it "will have to drastically revise its policies vis-à-vis Israel and Palestine". Writing days after the end of Israel’s three-week Gaza offensive, he says the Bush administration, which supported the onslaught, had left a “sickening legacy in the region”. And while Saudi Arabia has so far resisted Iranian calls to lead a “jihad” against Israel, “ eventually the kingdom will not be able to prevent its citizens from joining the worldwide revolt against Israel”.The prince-writing before President Barack Obama made his comments on the Arab-Israel conflict last night-holds no official position in the Saudi government at the moment but his views reflect the mounting frustrations within the al-Saud royal family and the apparent need to exert immediate pressure on the Obama administration for a more even-handed Middle East policy. So while on a similar platform as Erdogan, Saudi Arabian ambassadors or prince's would have kept quite like a scared mouse, Erdogan had the courage to speak his mind. Anyway, because of his courage to speak against Israel, he will probably be made to suffer soon. Even though the Arab press has hailed him as a hero, there is already a talk that he risks mediator role and Turkey's EU chances have been ruined and his outburst could damage Turkey's International standing. To me he did what any decent person should have done and of course I wouldnt have ever expected this from an Arab leader, Erdogan didnt surprise me.